Please pass on our appreciation to all the staff at Burghley which made our recent Society outing go very smoothly and you patience with our varying number of players. The friendliness and efficiency of you all is to be commended, especially Chris our 'greeter/hostess' and Mark from the Pro shop. We also need to include the staff who provided the coffee and bacon roll, excellent refreshment and service. The course was in very good condition and quite testing at times but we all enjoyed the challenge! I have received lots of positive comments from our visit to Burghley and that is a reflection of how well you all work together and the service you provide. On behalf of Ewerby Golf Society. The lads from Melton Mowbray Golf Club would like to thank you for the welcome by all parties connected to our visit on Thursday 25th May. A nice touch by your Lady Captain to meet and greet etc. Much appreciated, David Compton, organiser. and above all your good self, for making our visit most enjoyable. We wish you, and Burghley Park Golf Club every success for the future. 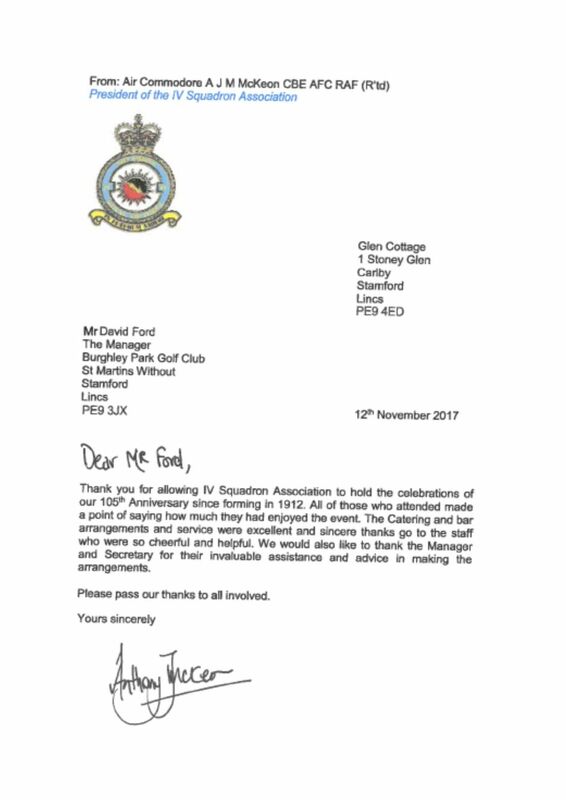 Just a quick thank you note to you and your staff who made us very welcome during our recent visit to your club. The two lady hostesses who joined in with the banter and lifted the spirits of some weary golfers. Your course was in excellent condition and is a credit to your green staff. It was a pleasure to play. We would have no qualms in recommending Burghley Park to other clubs in our area, nor would we have any problems in returning in the future. Thanks for all your help prior to and during our visit. Right from the initial stages of organising the event Sam and her team in the office at Burghley could not have been more helpful. On arrival at the club it was lovely to sit with Sam & Elaine who informed me about the club, course, membership etc. helped with the cards, started us off the first tee and supplied us all with a goodie bag. The Breakfast was first class and it was a nice touch when the chef came out and asked if we were ready to eat and throughout the meal asked if we had everything we needed. Also had a chat with a member of the bar staff who said that he would be open on completion of our round. It was also nice when the Pro came across to the patio area afterwards and asked if we enjoyed the course and how we performed on the day. I could not recommend Burghley Park more for a golf day, the course was in fantastic condition and would not hesitate in booking again in the near future. We were spoilt and pampered by your staff who you can be proud of. Food was brilliant and I must say what a good kitchen you have. So, many thanks, and I shall work on our next years captain to make sure we return. Just a quick thank you for the superb day we had at your wonderful golf club on Friday. The course was in excellent condition and the catering was first class. We were most impressed by the warmth and professional way in which we were greeted by Donald and Elaine, which we thought was a wonderful touch. Please convey our thanks to all involved who made our day so memorable. Copyright © 2019 Burghley Park Golf Club Limited. All rights reserved.